SALT LAKE CITY, Utah – What’s better than a boost pedal for guitarists who need some extra volume for solos and when they need to stand out from the rest of the band? HARMAN’s DigiTech new Tone Boost e-pedal for the iStomp. The Tone Boost offers two boost options – a straight clean boost and an adjustable boost for a specific frequency range. 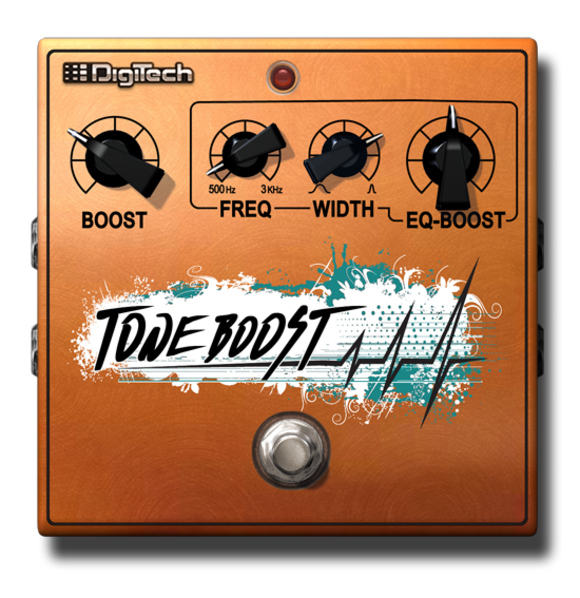 The DigiTech Tone Boost offers up to 20dB of clean boost and 20dB of frequency-specific boost. The BOOST knob provides a straight-head clean boost. For frequency-specific tone shaping, the FREQUENCY control lets players select the frequency they want to emphasize and the WIDTH knob adjusts the frequency bandwidth, from a narrow range to a wider frequency spectrum. The EQ BOOST control gives an additional 20dB of boost, and the BOOST and EQ BOOST controls can be used together if desired. The Tone Boost offers true stereo operation, for use in stereo pedalboard setups and with two amplifiers. The DigiTech Tone Boost e-pedal will be available in October 2012 at an introductory price of $0.99. This introductory price will run for the next 30 days. After the introductory period the price will change to $9.99. The DigiTech iStomp is currently available at $149.95 suggested retail.